"No hoof, no horse" is a time-honoured saying in equestrian circles but I've never heard a cry of "No foot, no dog" in canine circles. And when I see judging at dog shows, I find it rare indeed to see a judge check a dog's feet. But which is more important, sound feet or set of tail? I suppose in an arena where dogs are valued solely for what they look like rather than what they can do, this is not surprising. 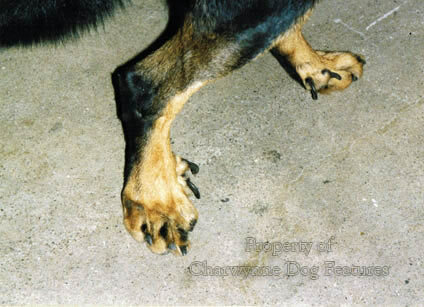 Ignoring the soundness of your dogs' feet is however a recipe for disaster in breeding programmes. Unless sound feet are produced in every breed of dog from toy breeds to giant ones, then the future of the domestic pedigree dog as an active animal is threatened. Does that mean small for the size of the dog or small when compared to a bigger breed? If judges look out, in these breeds, for feet smaller in proportion to the size of dog than is sensible, is that right or wrong according to the breed standard? It is surely essential for each breed of dog to have feet of a size appropriate to its weight. It is bad enough when a standard calls for unwise features such as: head - enormous, as in the Dogue de Bordeaux, or: head -- massive, as in the Cane Corso. It is even more damaging if a dog's feet are bred to a harmful design. Being able to walk is fairly important to dogs! 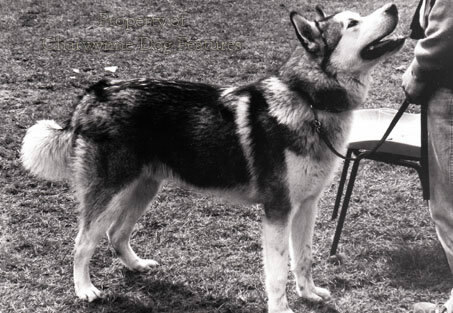 In the early years of dog-showing, breeds were judged to a scale of points. In the Yorkshire Terrier for example, the colour of hair on the body was assessed out of 20 points, whilst the legs and feet were only capable of scoring 5 points. Can this be the right priorities? Dogs walk on their feet, using their legs; isn't their locomotion of far greater importance than the colour of body hair? 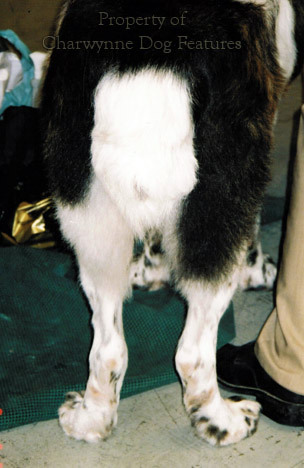 In the Maltese, the length and texture of the coat could attract 20 points, the legs and feet only a quarter of that. Is it surprising that some small dogs move badly? The Italian Greyhound's feet could total 8 points - the same as its tail. Who approves such misguided thinking? 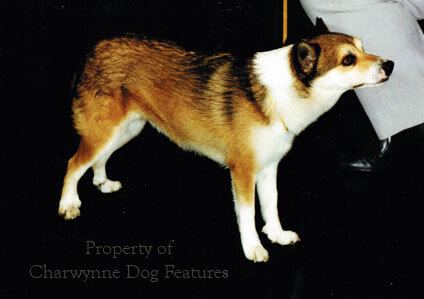 It is important to keep in mind too the origin of the breed when considering feet, i.e. what the breed was designed to do. Galloping breeds like the sighthounds have great freedom of the upper arm and elbows which are separated from the chest wall. The Greyhound's weight falls mainly on the toe-pads. The German Shepherd Dog's weight falls on to the heel-pad of the forefoot. The Greyhound is therefore usually seen more 'up on the feet' comparatively in its stance. The soundness or otherwise of the foot can affect the balance of a dog. If the heel-pad is not sharing the body weight of the dog with the toe-pads, then the latter are bearing extra weight and this will in time weaken the toes. The dog's knee will absorb what the toes haven't the strength to do. 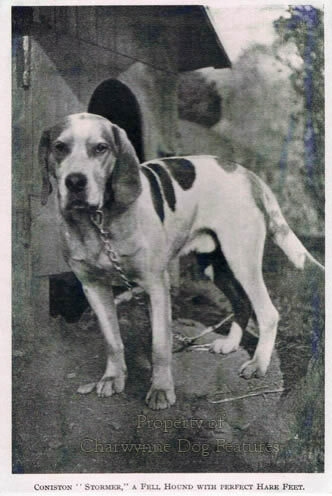 This is why at the turn of the century, when Foxhounds were favoured with massively timbered forelegs and a fleshy, contracted, bunched-up foot, so many stood over at the knee, to reduce the jarring. Such hounds had their weight all on the forehand, which in turn led to their shoulders becoming more upright. There is a danger in the pursuit of round, over-compact, knuckled-over, bunched-toed feet.